Who defines history? The established historical cannon focuses more on world leaders, and less on the figures who toil in fields, fight in wars, and help drive important social and political movements. 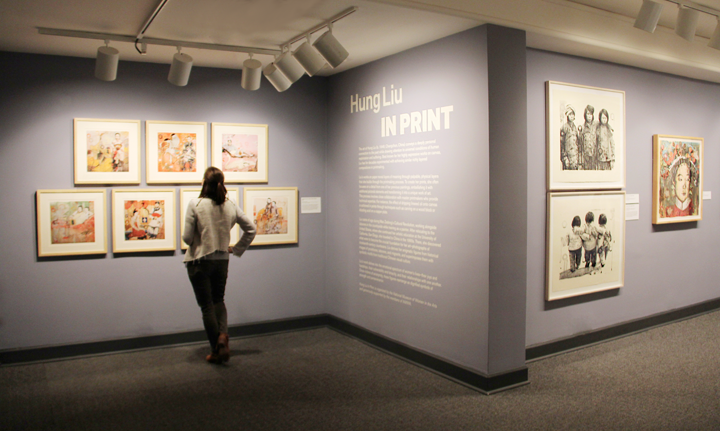 Hung Liu In Print, NMWA’s newest exhibition, features works by Chinese artist Hung Liu (b. 1948) that pay homage to the forgotten individuals who influence history. 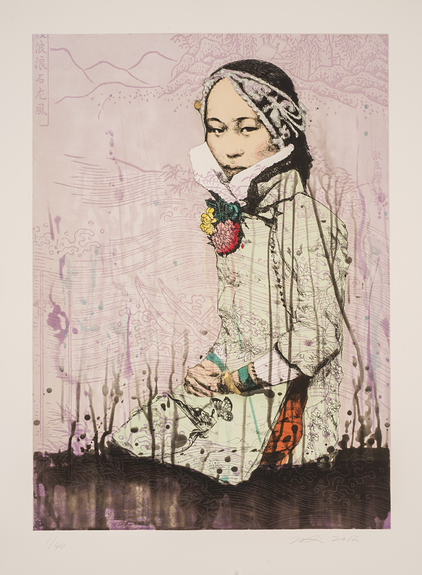 One of the works in the exhibition, Shui-Water (2012), portrays a young woman kneeling with her hands resting firmly in her lap. The subtly rendered landscape and the delicately outlined flowers on her clothing reference traditional Chinese painting. Like many of Liu’s subjects, the woman depicted confidently meets the viewer’s gaze. Liu’s subject, though anonymous, exudes power and dignity. Liu grew up during the Cultural Revolution in China and witnessed mass famine during Mao Zedong’s Great Leap Forward, an economic and social movement that devastated China’s economy. Liu labored in rice and wheat fields in the countryside for four years. Although she studied painting during the Cultural Revolution in the 1970s, the Maoist regime required that she painted in a realistic style that did not allow for much personal expression. After being denied a passport by the Chinese government for three years, she immigrated to the United States in 1984 to attend the University of California, San Diego to continue studying art. Free from the restrictions of the Cultural Revolution, she developed her own artistic style. Liu’s distinctive personal style combines naturalism with abstraction. While her figures are rendered with realistic detail, they are often situated in imaginative settings. Her characteristic drip marks are achieved by using a variety of printmaking techniques. For some prints, the dripping effect is created through irregular incisions cut into the wood. For others, she allows acid to drip directly onto the etching plate. Liu simultaneously preserves and dissolves the figures in the images. While the drip marks allude to the fading of old photographs and memories, the vivid colors illuminate her subjects, giving them a voice despite their anonymity. Visit Hung Liu In Print in the Teresa Lozano Long Gallery through July 8, 2018. This entry was posted in Artist Spotlight, NMWA Exhibitions and tagged Hung Liu, Hung Liu In Print by Women in the Arts. Bookmark the permalink.